A 90-minute walk along Dawlish seafront led by Professor Antony Buller. Looking at the development of the town from Saxon times onwards, its geological setting and the impact of the railway on the coastline. Meet at 2.30 pm. at Dawlish railway station. Our second excursion of 2017 was conducted on the Dawlish sea wall between Coryton’s Cove and the section that was rebuilt after the horrendous storm damage of February 2014. 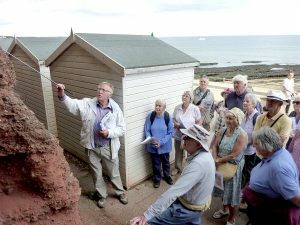 Professor Tony Buller guided 24 members of the branch in masterly fashion through the 350 million years of geological history and the thousand years of human history which make up the 21st-century Dawlish. Prior to the arrival of Brunel’s railway in the 1850’s, Dawlish had established itself as a highly regarded watering place for the well-to-do and those needing clean sea air for medicinal purposes. In fact, in 1810 it was considered the very Best in the West. Small farm agriculture/horticulture was well established in the narrow valley of Dawlish Water following the draining of the swamp that characterised many of the low-lying bays of the South Devon coast. Fishing provided a living for 180 fishermen and the Fisherman’s shelter below Lea Mount, the third of such buildings, is a strong reminder of the town’s fishing past. On the beach at Coryton’s Cove we were fascinated by Tony’s interpretation of the rock outcrops which back the cove. We were introduced to conglomerates, breccias, honeycomb weathering, foresets, cross bedding and the changes in the landscape from 1795 as illustrated by Rev. Swete’s watercolour of the rocks separating the cove from the main Dawlish beach. Tony is an excellent story-teller: that 24 people set out and 22 were there at the finish, and that the two that left only did so because they had grandparenting duties to fulfil, is testimony to his ability to make technical and scientific material interesting and informative to a wide-ranging group of listeners.